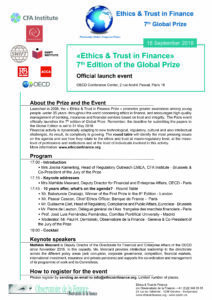 The 7th edition of the “Ethics & Trust in Finance Global Prize” was officially launched on 18 September 2018 at 5 pm at the OECD Conference Center in Paris. The launch program is downloadable. Every two years, the Prize invites young professionals to participate and contribute to the reflection of the importance on the benefits of a more ethical approach to banking and finance, promoting greater awareness of the need for ethics, integrity and trust in the finance sector. Since 2006, the competition has prompted a debate about many different aspects of Ethics in Finance, ranging from the role of compliance offices, the challenges of managing cash ethically, the contribution of micro-finance to economic development, and the way rating systems work, to name but a few. Candidates are invited to submit written papers that have not been previously published that examine the role of ethics and integrity in finance, especially taking account of the three aspects of the question mentioned above. The papers could be analytical in character or they could be proposals for practical projects. In all cases, they should meet three criteria: intellectual rigour, innovative ideas, and clear conclusions. Best papers submitted in previous editions are available in this site.